After hearing the first Fàshiön Music album, “Product Perfect” back in 1979, I didn’t expect to hear them resurface again three years later as a completely different band, but one afternoon when MTV debuted on my cable system to my enrapt eyeballs and ears, I saw the video for “Love Shadow” that had the band now making sophisticated synth-funk complete with gratuitous∞ Gina Kikoine guest vocals! I glommed onto a copy of the UK 2×12″ of “Love Shadow” and a surprisingly long time later [a few years?] I bought a LP of the second album, “Fabrique.” It became a late-in-the-game favorite of mine for 1982 as the 80s ended for me. The next decade, I spent my time and effort in completing my collection of all of the singles from this Zeus B. Held-produced opus. “Steeetplayer-Mechanik” is but one of them. ∞ – can there really be such a thing? The Münich technothrob of this one in its [audiø extra]” 12″ mix was unbelievably strong with this one; opening as it did with synth bass that soon got overlaid with Simmons drums and vocoded as well as whispered vocals that were as sleek as a Maserati. The squelching wooshes of synths added tension to the motorik rhythms that the song rode upon through the Berlin streets at night. Singer De Harris’ angular guitar licks added to the immaculate poise of it all. I was in awe at how producer Held was able to fuse an analog funk band with what sounded like a king’s ransom of almost grotesque levels of high technology. Maybe only the music of Japan, ca. “Gentlemen Take Polaroids” sounded remotely like this as exemplars of just how far technology could go in crafting complex, yet hook-laden dance music to sate the brows the most discerning of jazz aficionados. The 12″ played out for a glorious 8:23 since any shorter would have implied that this luxury had been moderated. A serious no-no in my book. The dub mix of “Mutant Mix Mechanik” offered another 7:13 of instrumental dubmix that allowed the almost Mororder-rich instrumentation to glint gloriously in the early morning moonlight. The synths and rhythm instrumentation rise and fall in a give-and-take battle for supremacy here. Of times, just a machine rhythm left as everything else has been dubbed out. This gave every element of the mix a chance to show off magnificently. The B-side here was a brief dub mix of “Dressed To Kill” from the “Fabrique” album The dub allowed the spherical bass synth to take early spotlight before the funk guitar of Mr. Harris took the opportunity to politely go nuts. I love the dubbed in vocal hook of “dressed to kill!” as the only vocal complement following the descending synth hook. The Chapman Stick-like synth hooks I heard among the sound of squealing tires mixed seamlessly with screams attain an otherworldly sense of dread for this quivering slice of matte-black nite-funk. The Fashiøn vibe on this single was to skirt the edges of a rushing, decadent delirium of electric funk. I consider it a crime that I never once heard this band and period of music played in a dance club. Fashiøn of this album period is an unsurpassed pleasure that always thrills me to no end when I indulge. I have each of the 7″ and 12″ singles from the “Fabrique” album and have been pencilling in the long-waited REVO edition that will encompass it all, but wait! 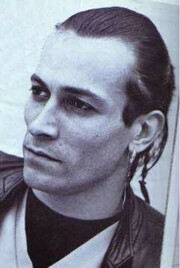 Just this lunchbreak, I have learned that vocalist De Harris released a solo single in 1987 of a new version of the by then five year old “Love Shadow” single on UK Arista in 1987! How did I not see this all these years earlier? The 7″ and 12″ of this are now at the top of my want list with select few dealers in the world trafficking in the desired singles. I’ll have to get these, and soon! This entry was posted in Record Review and tagged 1982, Fabrique, Fashion, funk, Zeus B. Held. Bookmark the permalink. nick – I got my copy about a decade ago when it was reissued by Cherry Red the first time. In the late 90s, when I first heard of the initial Arista German release of 1990 [which was OOP] I would have paid $100 for a copy, if I had only found a single person selling one! Terrible cover/title, considering that it is actually the cassette version [with edits] of “Fabrique.” I’m still glad it’s in my Record Cell! And those wonderful 12″ extended versions and bonus tracks were only [at the time] on my Canadian cassette release, eh? Still quite listenable after all these years. KeithC: So our Canadian neighbors got the same double play cassette as the UK? Maybe it was a Commonwealth thing? [checks Discogs] No! Even America got the double play cassette! Nice to know we were not slighted as was usually the custom. 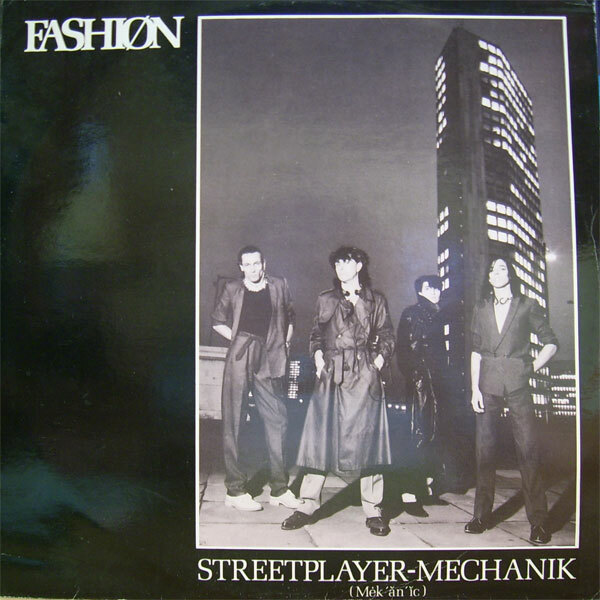 I think it was through a Monk comment on Discogs about Fashion that I first came to find this blog,so Fashion have a lot to be thanked for-not least the sublime album and singles of which you write. I only have the “Fabrique” vinyl LP and the cd “Height of Fashion”,plus the “Love Shadow” double 12″ and the vinyl LP of “Product Perfect”. I have never heard the later albums. Gavin – I have “Twilight Of Idols” and the “Eye Talk” 12″ but I’ve never worked up the courage to actually play them, since I’m too much in awe of the De Harris era to risk the inevitable, I think, disappointment. It’s funny how Fashiøn had three albums with three different vocalists, who were the primary writers of each album. If my glowing review managed to pull you into orbit around Planet PPM then all is right with the world! I wish I could hang out with the commenters who frequent here and talk music until my voice gave out. I can’t remember what the 2 songs on the B-side are like, I’ll have to dig out the record one of these days. Bill Barnett – Welcome to the comments! All “Fabrique” fans are welcome to the party. Yes, I’ve been aware of the Zee project for a few months now. What I didn’t know until even later was the Dee Harris version of “Love Shadow.” I bought the Im-Mac Logic 12″ on sight due to the Malcolm Garrett references with the issuing label only to find that it had a Fashiøn connection after looking more carefully. I reviewed the record in September of 2011. Aha, now that I figured out how to use the search correctly I see you’ve got that all covered. :) Thanks for giving me the impetus to go trawling on Youtube… The live video of “Move On” in Germany, with Harris playing a double-neck guitar/bass, is fantastic! He’s got real star quality (& chops), it’s a shame he more or less disappeared. Bill Barnett – Harris fell in with Sandii + The Sunsetz [!] as well as producing the band Hula Rock [no connection] afterward.